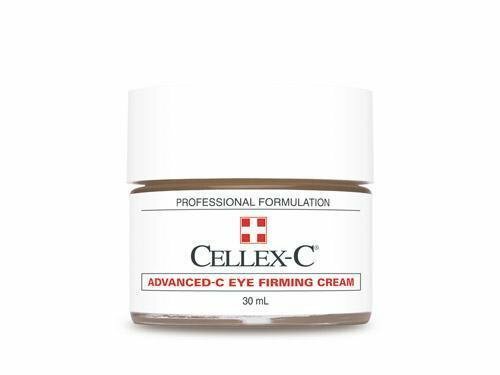 Cellex-C Advanced-C Eye Firming Cream is a moisturizing formulation that dramatically reduces the visible signs of aging around the eyes: sagging skin, crow’s feet, fine lines and wrinkles. The light texture spreads easily and penetrates quickly, leaving the eye area smooth and soft, never greasy. In addition to the Cellex-C Patented Complex, adjusted for use around the delicate eye area, Advanced-C Eye Firming Cream contains 10% vitamin C and collagen-supporting antioxidants resveratrol, grapeseed extract and L-ergothioneine. Water (Aqua), Ascorbic Acid, Caprylic/Capric Triglyceride, Glycerin, Ceteareth-20, Tyrosine, Stearic Acid, Cetyl Alcohol, Emulsifying Wax, Dimethicone, Zinc Sulfate, Evening Primrose (Oenothera Biennis) Oil, Glycine, Grape Leaf (Vitis Vinifera) Extract, Grape Seed (Vitis Vinifera) Extract, Cetearyl Alcohol, Tocopheryl Acetate, Chamomile (Anthemis Nobilis) Extract, Aloe Barbadensis Gel, Allantoin, Phenoxyethanol, Disodium EDTA, Methylparaben, Polysorbate 20, Fragrance (Parfum), Propylparaben.